Give Mom A Gift She Will Love – E3 Natural Skin Creams – On Sale for May! For the month of May, purchase our Earth’s Essential Cream or E3 Light Crème at a 15% discount (prices already reduced online, no coupon necessary) or purchase one of the two-pack cream combos and save 25% off the regular retail! Makes a great gift for Mom! E3 Light Crème — is a replenishing blend of ingredients combined with Pure Algae Extract to supply enzymes and energy. E3 Earth’s Essential Cream nurtures dry, chapped skin to leave it smooth and supple, with a dewy glow. Offer ends May 31st, 2013 at midnight est. Still a Few Days Left to Get a Free Bottle of E3Live! Planting a garden for the animals? I wasn’t sure about my oldest daughter’s idea, but I had promised her a space in our garden. Getting kids outside and active is important – giving them their own project builds their confidence! Now is the time of year we start our seedlings in the greenhouse (or inside the house). I thought she might like to plant some flowers or grow some special foods for herself. Instead, she wanted to grow some food for our variety of animals. Brooke is obsessed with the animals we have running around. At eight years old, she would rather clean the horse stall, feed the chickens, or milk the goats than go to a park to play. She can happily spend hours feeding grass to the animals and making them “special treats” of her own creation with weeds, flowers and leaves. So for Brooke, it’s a labor of love to plant a garden and tend it for the animal – especially with our short and erratic growing season in Southern Oregon. Her logic is definitely sound. I spend a lot of time educating them on how and why we garden and grow things for ourselves. Our organic garden is free of chemical fertilizers and pesticides. It’s also the freshest produce you can find! Each time we work in the garden we discuss why we grow our own food and why it is healthier. They learn about each type of plant and how to grow as well as harvest it. The ability to go out in the yard and pick vegetables as you need them is both rewarding and delicious. We will also preserve our excess in the fall, and sell what we cannot use. So this year our animals will also benefit from some extra goodies. We planted carrots, corn, cucumbers, and squash for them to eat. In return for the fresh and nutritional additions to their diet, we will be given eggs, milk and of course companionship! 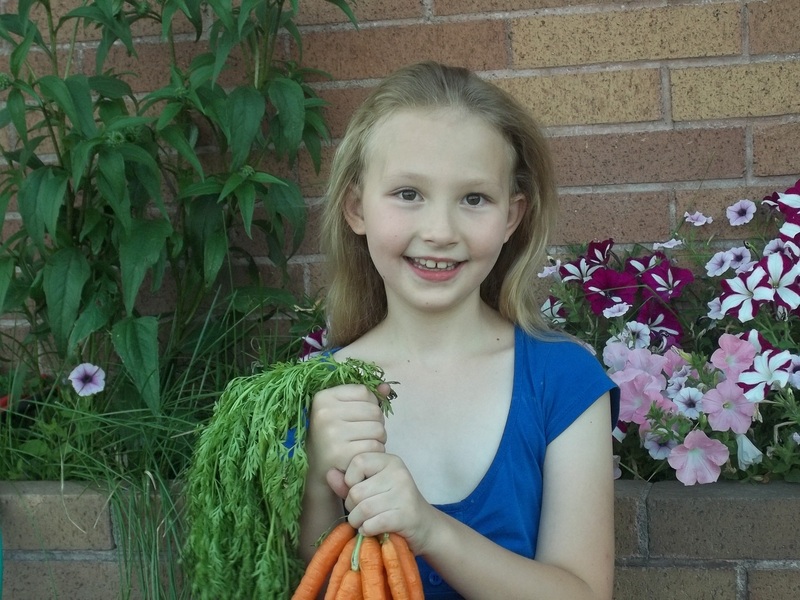 Plus, I have one proud little girl that will spend many hours weeding and tending to her garden. The physical activity will keep her busy this summer, and the pride in her work and responsibility will set her up for a lifetime of success. I encourage everyone to get their kids involved in activities like this. They are low cost, and children love to be involved with anything that gets them covered in dirt. Happy, healthy, and active children tend to follow the patterns set in their childhood for most of their life. Not only is this a great bonding time, but a way to encourage a lifetime of healthy behavior. What gardening ideas do you do with your kids? Tell us below!